This August marks the 50th anniversary of one of the most iconic pony cars ever made. The Chevrolet Camaro has been turning heads, and taking names since it first came on the market exactly fifty years ago. Designed to directly compete with the Ford Mustang back in 1966, the Camaro has not only proven its worth with respect to that initial purpose, it has also blown every expectation out of the water. The newest edition is hitting Chevy dealers across the country, and it’s a special one to say the least. The Camaro’s fiftieth year is a milestone worthy of celebration. General Motors knows that, Chevrolet knows that, and everyone who has had the honor of driving a Camaro knows that. A fifty-year birthday or anniversary for an automotive nameplate is a rare occurrence these days. This industry undergoes such rapid growth and evolution, that manufactures are constantly retiring model names and introducing new ones. The “Motor City” is not only celebrating this rare milestone for the Camaro, they are embracing it in the purest, most appropriate way. Let’s Rally is the mantra behind the 50-year celebration that will take place this August, and from the looks of it, the bowtie brand is sparing no expense to ensure that it is done right. Complete with its own hashtag, #CamaroFifty is sure to be an epic event that will draw thousands of participants who share a common love for the pony car. Starting with a tour of the Camaro factory, the three-day event will feature a Camaro Fifty Rally, before ending with the annual Woodward Dream Cruise on the final day. No vehicle anniversary celebration is complete without the unveiling of a special edition model, which is certainly the case with the Camaro. 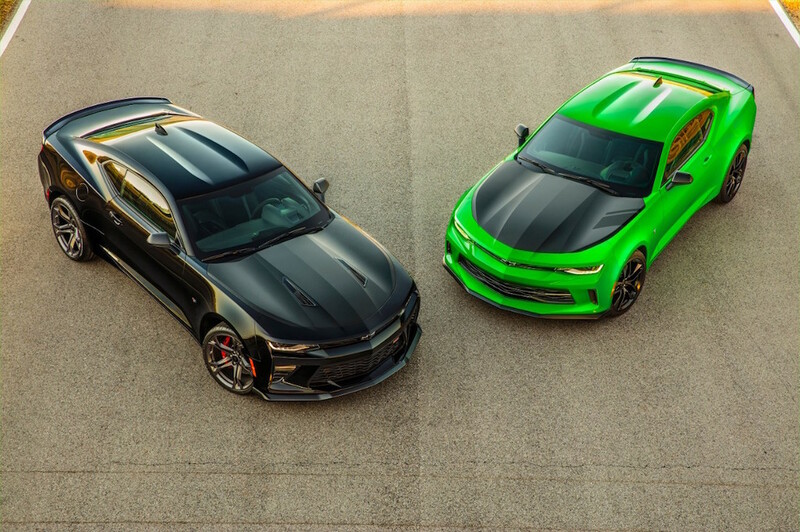 From tours, to parties, to a look back at the rich history of the Camaro, Chevrolet is pulling out all the stops for this exciting milestone. Not only was the Camaro entirely redesigned for the 2017 model year, the bowtie brand is also offering a special edition version specifically aimed at celebrating the car’s 50-year anniversary. Highlights of the newest generation of the Camaro include more performance options, the comeback of the ZL1 coupe, and a “FIFTY” badge on every 2017 Camaro steering wheel. It may not seem like a lot, but rest assured, Chevrolet is delivering more than standard expectations for the 2017 Camaro. Distinct Exterior Styling: The new Camaro stands on its own with the complete redesign it received for this 2017 model year, and the 50th Anniversary Edition adds to the unique new design. Featuring an exclusive Nightfall Gray Metallic exterior paint, convertible variants will also be outfitted with a Black top to complement the sleek styling choice. The exterior of this Camaro also includes a special 50th Anniversary stripe package, along with matching exterior badges. The newly designed front grille is finished with satin chrome accents, and the front splitter matches the car’s body color for a more unified and polished look. This edition stands out from the rest of the 2017 Camaro models on the road, but does so in a subtle way, as to not take attention away from the new Camaro design. Performance Enhancements: No special edition Camaro is complete without some performance tweaks and inclusions. The 50th Anniversary Edition offers both. With 20-inch 50th Anniversary-specific wheels and center wheel caps, the Camaro is given a style enhancement, along with a performance upgrade. Orange brake calipers offer the same, and stand out brilliantly against the dark gray backdrop of the Camaro’s body. Of course, the 50th Anniversary Edition offers the same performance and power as the redesigned 2017 models, but is given enough of an edge to make it even more unique. Interior Styling: The interior of the 2017 Camaro 50th Anniversary Edition offers a sleek Black leather interior, complete with suede inserts. Orange stitching accents the dark leather seating surfaces, and unifies the same design elements from the cars exterior styling. 50th Anniversary badging is present throughout the interior cabin, and is included on the seatbacks, instrument panel, illuminated sill plates, and the steering wheel. Everything about the 50th Anniversary Edition of the Camaro is designed to provide drivers with their own piece of automotive history. For sports car enthusiasts who aren’t in a position to purchase the new Camaro, a host of Camaro 50th swag is available from Chevrolet. From drinkware to driving shoes, no one will be left out of the celebration, and the honor of owning a small piece of history. As Detroit celebrates the impressive milestone that the Camaro has easily reached, so will every Chevy dealer across the nation. That includes DePaula Chevrolet, right here in Albany, NY. We can’t wait to show you just how impressive the newly redesigned 2017 Camaro truly is, and give you a taste of what it feels like to get behind the wheel of one. Be sure to come down and visit us soon, and follow all of the Camaro Fifty celebrations in Detroit, as well as here at home. As the Camaro is honored with 50 years in production, we here at DePaula Chevy are honored to be a Chevrolet dealer that offers drivers great deals on one of the longest-lasting nameplates in United States history. If you want to order your own Camaro 50th Anniversary Edition, be sure to come down to DePaula soon, before it’s too late. We can’t wait to work with you to get you in your very own #CamaroFifty.